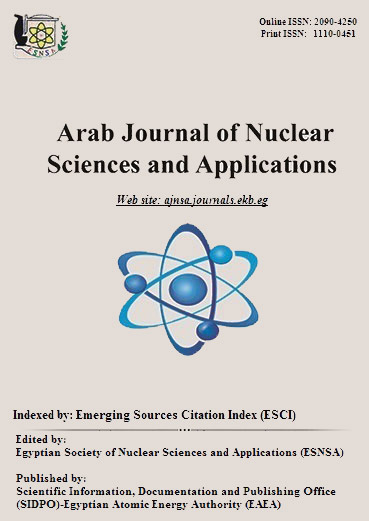 1Central laboratory for Elemental and Isotopic Analysis, Nuclear Research Center, Atomic Energy Authority, p.O.Box, 13759, About Zabal, Egypt. Study on the thermochemistry of species (40Ar35Cl+, 59Co16O+, 36Ar38Ar1H+, 38Ar37Cl+, 36Ar39K+, 150Nd++, 150Sm++and 150Eu++) that interfere with arsenic in inductively coupled plasma mass spectrometer. Moreover (AsCH3F+, AsF+, AsCH2+, AsCHF+ and AsO+) that result from the reactions between arsenic and different gases such as H2, O2 and CH3F which are common used in dynamic reaction cell-inductively coupled plasma- mass spectrometer have been investigated. The structures of polyatomic molecules are optimized; ionization energies, heats of formation (ΔfH°0 and ΔfH°298) and proton affinity (PA) of some species are estimated by quantum chemistry calculations using different methods in Gaussian 09. In this work Gaussian 09 is used for calculating thermochemistry of species (40Ar35Cl+, 59CThe species (AsCH3F+, AsF+, AsCH2+, AsCHF+ and AsO+), that obtained from the reactions between arsenic and different gases which are common used in DRC-ICP-MS using G3 and CBS-Q methods of calculations except (150Nd++, 150Sm++and 150Eu++) are calculated using MP2/CEP-4G and MP3/CEP-4G methods. Proton affinity of 36Ar38ArH+ and 40Ar34SH+ are calculated and gave values 326.112 and 866.742, respectively.